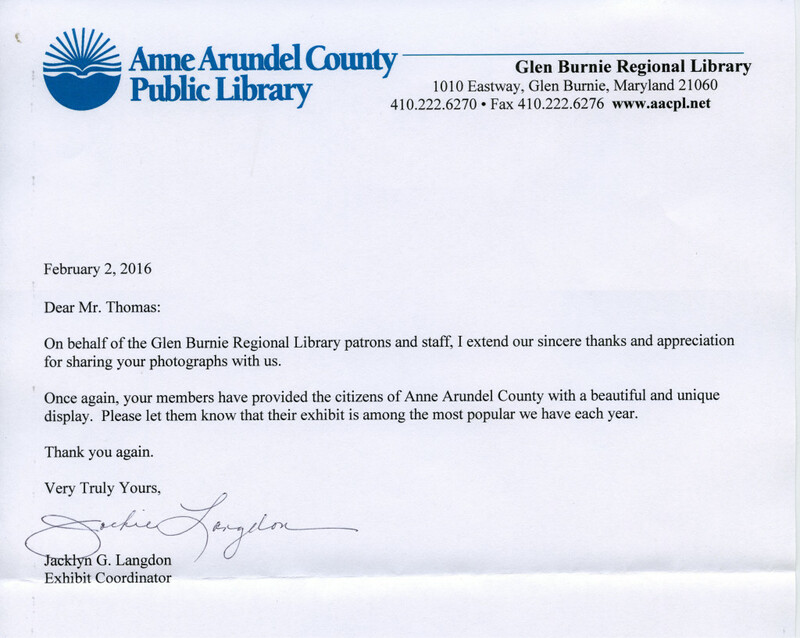 Every Year we hang an exhibit at the Glen Burnie Library. Each club member brings three images that are printed, matted, framed, and wired – ready to hang. This year we will hang the exhibit on January 6th at 1:00 PM followed by a late lunch at Outback Steak house. We will meet at 1:00 PM on February 3rd to take down the exhibit. On Tuesday December 18th a few members will be traveling to New York City all day for two Cyanotype photography exhibits at the New York Public Library. One exhibit highlights the life and works of Anna Atkins, English botanist and photographer who is credited as publishing the first photo book and due to her friendship with Sir William Henry Fox Talbot she very well may be the first female photographer too. The other exhibit features 19 current practitioners of the Cyanotype process. Invented in 1842, the Cyanotype process uses two readily available and relatively safe chemicals to make a blue photogram/photograph. This process is widely still used today and safe enough that member Christine Milleker primarily uses it in her kids’ workshops to introduce them to alternative processes in photography. Time permitting we hope to walk to Rockefeller Center, get dinner nearby and then head back. Everyone is invited, message us if interested. 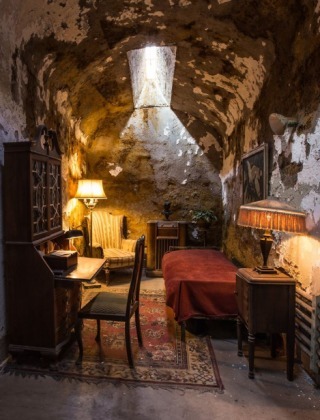 We may have one seat available and if there are more we’ll help get people together for car-pooling and directions to our favorite parking garage. If you are unable to make it this day but would still like to visit the exhibit, the Anna Atkins exhibit ends on February 17th while the Contemporary exhibit ends January 6th. Typically we park near the Newark Airport in a garage for about $10 a car and take the bus into the city. The bus is $30 round trip per person and both drops off and picks up at the Library. 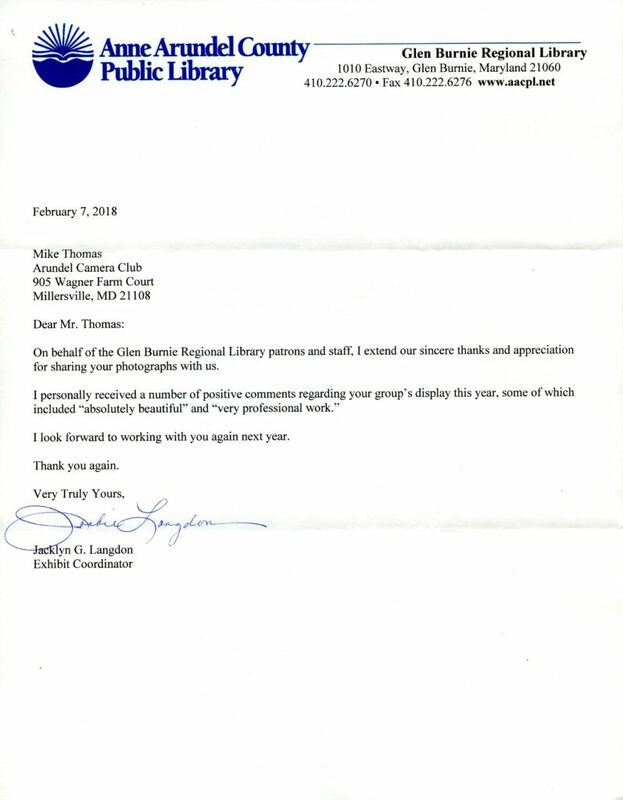 In appreciation for our annual club exhibit at the Glen Burnie Regional Library, we received a very nice letter of appreciation. 2017 Nov. 12: Mark Your Calendars for a Gallery Show!! 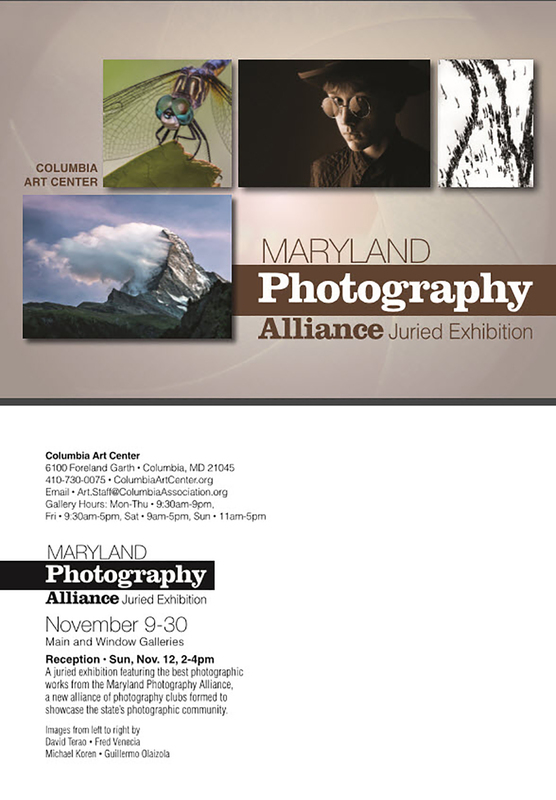 Arundel Camera Club is one of the founding members of the new Maryland Photography Alliance (MPA). MPA’s first photography contest has been completed, and over 70 images are going to be on display at the Columbia Art Center from November 9 through November 30. An opening reception is taking place on Sunday, November 12 from 2-4pm. 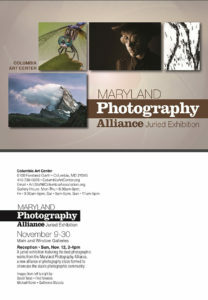 We hope you will be able to attend to view images from very talented photographers in Maryland. 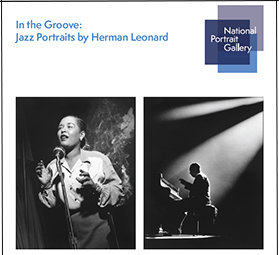 This exhibition from the collection of the National Portrait Gallery features Leonard’s iconic images of jazz legends such as Duke Ellington, Ella Fitzgerald, Dizzy Gillespie, Billie Holiday, The lonious Monk and Sarah Vaughan. This exhibition is available for booking. In case you haven’t had a chance to go and see it for yourself, here is a review of the gallery show that features our very own Brian Flynn at Glen Echo Park’s Photoworks. The images in “Mirror to the World”—the eighth annual documentary photography exhibit curated by District photographer Frank Van Riper at Glen Echo’s Photoworks—are worthy successors to the franchise. But the degree to which the exhibit owes its success to the accompanying captions—rather than just the images—shouldn’t be underestimated. Interested in Showcasing Your Images at an Art Gallery? An attempt is underway for photography clubs in the Baltimore area, and surrounding counties, to work together to have one of the largest exhibits of photographic images ever on display. As many as 70 images may be chosen. There is no cost to submit your images for consideration. The only requirement is that you be a Maryland resident, and that if your image(s) are chosen, you must have them printed, matted, framed and wired*. All images on display can be sold, with you receiving 60% of the proceeds, and the gallery receiving 40% of your selling price. The art gallery where the images will be display is the Columbia Art Center in Howard County. All images submitted will be juried by no less than 3 experienced photographers. The Glen Burnie Regional Library expressing their thanks and appreciation for our recent club exhibit. 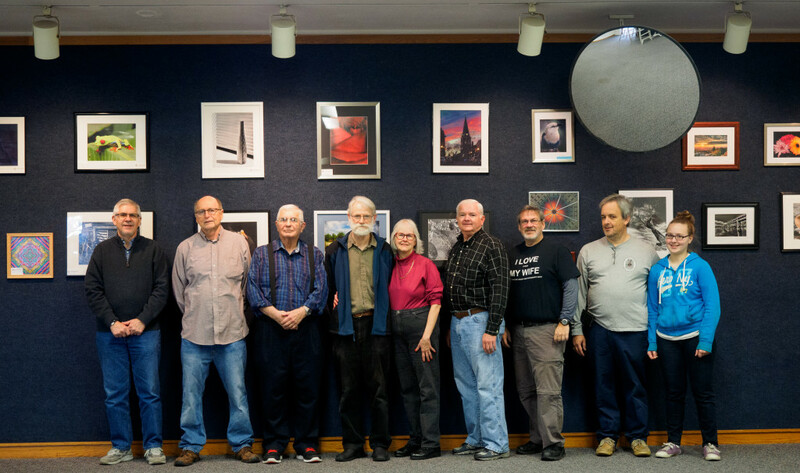 Today Club members hung our annual club exhibit today at the Glen Burnie Regional Library. We have 35 images on display. If you have a chance, please stop by the library this month and have a look. The exhibit comes down January 31st. Club members Ron, Paul, Louis, Bob, Susan, Charlie, Mike, Russ, and Brianna. We will need around 10-20 photographers to submit up to three images each. Please don’t forget to prep your prints over the holidays .